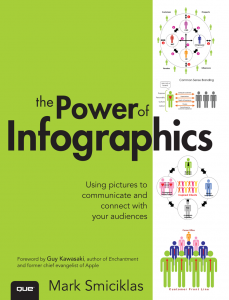 author of the new book “The Power of Infographics: Using Pictures to Communicate and Connect With Your Audiences “. How are you, Mark? Mark: I’m great Jay. How are you? Jay: Fantastic. I just finished the book a couple of days ago. It is really excellent. I’m very, very proud of your effort on this book. It’s a very useful book. Mark: Thank you very much. Yeah, that was the goal, to try to create something that most business people will get some value out of. Jay: I will make that happen. So, you are a marketing consultant with an emphasis on the digital side, but you also have been creating infographics for quite a few years now and some of your work is really spectacular. We’ll link to some of it here in the blog post that we write around the video. (note: see some of Mark’s work at his Flickr account here) How did you get into this? I mean, you’re not really a graphic designer by background as I understand it. How did you become sort of “infographic man”? Mark: Yeah, I’m not a designer, and that’s something I sort of stressed in the book. Infographics shouldn’t be intimidating to the point where it’s not art necessarily, it’s a communication medium. I’m trying to encourage people, that aren’t maybe designers or don’t have an art background, to sort of embrace this medium and try to use it. For me, I’ve always been a visual learner so it’s something that I’ve always sort of seen ideas in pictures. My inspiration actually came from David Armano, from Logic+Emotion, who’s with Edelman now. I saw some of his work and it just sort of resonated with me, and I sort of had this idea. more. So, if I’m going to invest three or four hours in a post I’d rather do it with a visual. I’m using Microsoft Publisher, which most graphic designers would laugh at that, right? But my goal is to basically just try to communicate ideas. It’s something that’s helped me build my business and my brand, so I just wanted to share how I started getting into that and some of the process and stuff. Jay: Yeah, you mentioned that you’re a visual learner and one of the things that you talked about in the book that surprised me is that 65% of us are visual learners. Do you think that’s the sort of impetus behind infographics and their popularity? Mark: I think, yeah. I think we have to be a little bit careful there because there’s a lot of people there that aren’t visual learners that don’t necessarily connect to that medium. But I think it’s more the hard wiring. From the research I did, we’re just sort of preconditioned to process information visually, more so than auditory, etc. So, that’s part of it. Then there are so many other things that have helped it explode in the last year, especially with social media. It’s just such a sharable form of content. Jay: You also talked about in the book, the notion of share-ability but also sort of skim-ability, right? That Jakob Nielsen and other people have researched that nobody really reads online anyway. This idea that they’re going to actually read your long blog post is mostly a fallacy, which breaks my heart because I typically write longer posts. going to read something based on that headline, because we all fill our readers. If we’re subscribing to hundreds of blogs, it’s physically impossible to read all that stuff. So infographics definitely break that. It sort of crosses that bridge for people to be able to more easily consume that content. One of the biggest things too, around the sense of infographics is you can create something… This is sort of the trick, I guess, and the challenge is to create an infographic that you sort of get a synopsis of the idea by just looking at it in whatever, five, 10 seconds, but then maybe also having the opportunity to dig into it a little bit deeper. So, that’s sort of the challenge of infographics now. What you’ll see is these long skyscraper type infographics that, in a lot of ways, is pushing us towards 1,000 word blog posts. Some of those things aren’t consumable either, right? So I think you have to sort of strike a balance between making it visually appealing and easy to consume, but also relevant and adds a bit of value as far as the information goes. I would encourage people to break stuff up. Just like you would do a series of blog posts. If you have three or four really solid ideas, turn those into a series of infographics. Jay: I think one of the other challenges that we’re seeing now in this explosive infographic era is the data sources are either not very good, or are lots and lots of different data sources kind of mashed up into one infographic. Are you seeing that as well? Mark: Yeah, absolutely. Well, the data is always an issue. You have to be really careful to check your sources. This is where thedata visualization piece – you pretty much have to be a bit of a researcher. You have to go through your due diligence, just like you’re citing stuff when you’re writing. You have to dig into the data, because a lot of times now you’ll have one report that comes out and you’ll have 20 blog posts written about that one report. Sometimes it’s so many steps removed if you can try to find that original link and skim through that data and see how legitimate it is, what organization sort of created it. think is behind the huge increase in infographics today? Is it that it is inherently a good way to communicate? Or is it that it is inherently shareable and good for SEO? Mark: I think the latter is the reason why it’s taken off. I think people see it as another way to market stuff, right? That’s the impetus, and so be it right? That works, absolutely. I look at it as more a way to communicate. Obviously, there is huge marketing benefit. There’s SEO. It’s sort of trendy now to do, so people sort of have, they’ve caught the wave. So just like anything else, sometimes they don’t really even think about it. That’s one of the issues too, is just like anything you’re going to do when it comes to communication. You have to look at why am I doing this? What’s the purpose? Sometimes it’s just like “Well, everybody else is doing this, so you know what? We’ve got to crank out an infographic”. as a really valuable method of communication. That’s what sort of resonated with me. When I see a picture it makes more sense to me as a learner. So, I’ve actually incorporated a lot of the stuff you see online, a lot of my stuff. I use that in client documents, right? I’ll use it in reports. I’ll use it in presentations. I find that A) it breaks the ice. It helps people – we just take it for granted that because we’re in the social media industry, that everybody understands all the terms and really gets it, right? That’s not necessarily the case. Even at the C Suite level, a lot of people still have some challenges understanding the ideas. I find infographics really help convey some of the real basic stuff as well as getting into details and showing some big picture thinking around digital and social. Will Infographic Resumes Take Off? Jay: You talked about, in the book, a section on infographic resumes and more and more people sort of doing that visual resume kind of thing. Do you think that’s going to take off or that’s going to be the sort of resume of the future? Jay: You’re talking from a hiring, HR, perspective, you mean? Mark: Yeah. We don’t know how to process a resume like that. If something like that comes to somebody it might be so foreign they might actually toss it. Jay: Yep. One of things that you broke down in the book, which was really useful and I actually didn’t expect it, was the different mechanisms by which you could have an infographic created. You know, you could hire a graphic designer, you could hire an infographic sort of agency, or you could DIY it, right? I mean, there are some tools out there that if you have some data that will kind of presto chango sort of make you an infographic, or you can pick from templates. Visual.ly is one of them. There are others out there. Jay: What’s your take on those? I mean, how do you feel about that sort of do-it-yourself infographic opportunity? Mark: Well, I think it’s cool. I mean, I think it’s the idea, especially the data stuff, because that’s something a lot harder to create. There’s design best practices that you probably want to adhere to, especially around data. So, I think some of these platforms, like Visual.ly is a great one, and they’re just evolving. They’re just basically starting out. Yeah. If you have data sets you can basically… I think at this stage a lot of them are taking data from things like your Twitter profile, Facebook. Mark: But there are other tools out there that are evolving to the point to where you can actually dump in your own data sets and have infographics created. As far as the variety of ways to do it, yeah, I go through in the book – I go through the sort of do-it-yourself approach, if you’re going to do that, some of things on how to start thinking visually. It’s not necessarily a book that’s going to show you how to draw stuff, but it preps you for the things you need to do if you want to do it yourself. Then, the idea of hiring a student, I think, is a very viable way for people that maybe don’t have the budget. There are also sort of pitfalls to watch out for and things like that. Are Infographics Too Hot and Faddish? 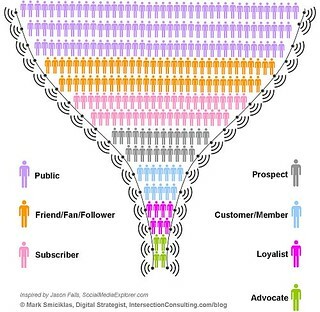 Jay: Does this infographic boom feeds into this whole culture of shortcuts that we always embrace, whether its Klout or number of Facebook fans or other things that are of somewhat murky value? I think to some degree people are using infographics for evil rather than good. You are certainly not amongst those, but I think that’s the challenge, right? those.” But that’s the same thing that’s been happening to marketing for 30 years, right? Somebody has a good idea and we immediately try and beat it into the ground until it has no more usefulness. Jay: We kill the golden goose over and over and over and so we just make more geese, man. It’s just like a geese manufacturing plant, you know? Mark: That’s right. We’re in the geese-making business, exactly. Jay: One of the things I really liked about the book – and I wish more books had this kind of resources, at the end – you’ve got actual, “Here’s people you should call. Here are freelancers. Here are designers. Here are agencies. Here’s phone numbers,” for people. It was really awesome to see that. I know it’s difficult because it’s hard to have a book like that and it always be current because six months from now there are different people on the scene or whatever. Mark: It’s something I sort of envisioned early on, because one of the biggest questions I have is, “How do you get started with it?” That’s sort of the impetus for the book, originally, is it’s just to provide a guide, a little road map for people, right? Part of that is the resources. So, I use a bunch of free tools. I use some paid stuff. We have to certainly be careful. It’s not about the technology necessarily. A lot of this stuff is around the idea and the concept. But you do need the tools to make it real in a lot of ways, and sort of to bring it to life. Again, what you said is absolutely true, you can’t list everybody. I’m sure I’ve left some people out in my research. I have to eventually stop researching and actually start writing. But one of the biggest things I encourage, and I think there’s a little note in the book about this is, check out your local market first. There’s always a ton of talented designers if you’re not going to do it yourself within your community, whether that’s through an art school or just connecting through with a graphic designer or whatever. Infographics”. We’ll make sure to have links to it as well. Congratulations, really, really, really happy with it. Great job. Mark: Thanks Jay. Thanks for having me.